If you have not purchased your ticket yet for this years FOSDEM MySQL, MariaDB and Friends Community Dinner, hurry! We’ve already sold 2/3 of our tickets since launching tickets sales last week. The dinner takes place in the same location, on the same day as the pre-FOSDEM MySQL Day 2019. The MySQL, MariaDB and Friends devroom was once again flooded with submissions. The committee, consisting of community members Daniël van Eeden, Art van Scheppingen, Giuseppe Maxia and Aurélien Lequoy, as well as Tom de Cooman for Percona, Vicentiu Ciorbaru for MariaDB and Nuno Carvalho for MySQL/Oracle, had the difficult job of whittling down 67 submissions into the final 17. All session will be taking place in H.1308, Rolin (to be confirmed) on Saturday 2 February. Please check closer to the time for any schedule changes. Look forward to seeing you there! Good news ! The MySQL, MariaDB & Friends Devroom has been accepted for FOSDEM’19 ‘s edition as announced earlier! This event is a real success story for the MySQL ecosystem; the content, the speakers and the attendees are growing every year. The first big change for this 2019 edition is that the MariaDB Foundation (Ian) is joining my efforts to build this Devroom. Don’t forget that FOSDEM takes place in Belgium, and our motto is “l’Union fait la Force” [“Unity is Strength”]. FOSDEM 2019’s edition will take place 2nd & 3rd February in Brussels and our MySQL, MariaDB & Friends devroom will run on Saturday 2nd (may change). FOSDEM & MySQL/MariaDB is a love story started 19 years ago ! The committee selecting the content for our devroom is not yet created and if you want to be part of this experience, just send me an email (candidate at mysqlmariadbandfriends dot eu) before Oct 29th. The Call for Paper is now offcialy open and ends November 15th. You can submit now() your proposal using FOSDEM’s submission tool. Marketing and Sales speeches are not welcome, focus on the engineering, the operations and of course the developers. Don’t forget to specify the track (MySQL, MariaDB and Friends devroom) and set the duration to 20 mins (short but intense ;-) )! Thank you, and see you soon in Brussels ! The FOSDEM organization just confirmed that again this year the ecosystem of your favorite database will have its Devroom ! More info to come soon, but save the day: 2 & 3rd February 2019 in Brussels ! It seems the MySQL & Friends Devroom (MariaDB, Percona, Oracle, and all tools in the ecosystem) will be held on Saturday (to be confirmed). The schedule of the next edition of the MySQL & Friends Devroom is now on-line also on the official FOSDEM website. As you can see we by shrinking the last two talks (no break) we were able to add one extra session. The committee selected the next one, which mean I will have the honour to present again at FOSDEM too. I hope you will enjoy this day. Don’t forget the MySQL Community Dinner (more to come soon about this on this website) and the extra free day organized by the MySQL Team on Friday (you need to register). MySQL Point-in-time recovery like a rockstar! This year was even more hard than previous years are we received 76 amazing submission ! 76 !! The Committee had the difficult task to choose only 15 of them. Thank you everybody: the committee, those that were accepted and those that were not accepted ! I hope to see you all in Brussels on February 4th ! And let’s hope next year we could have a second day for our FOSDEM MySQL & Friends devroom! 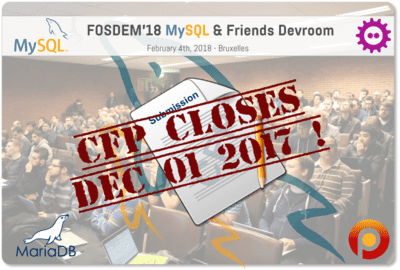 FOSDEM MySQL & Friends Devroom – Call for Papers ends December 1st ! As you can see some old friends are back in the Committee and we have also new names. As usual all big 3 MySQL distributions are present in the Committee and several Community Members are completing the list. Back to the topic of this article, the CfP will end on December 1st to let us review the proposed talks, check with the speakers and prepare the schedule. 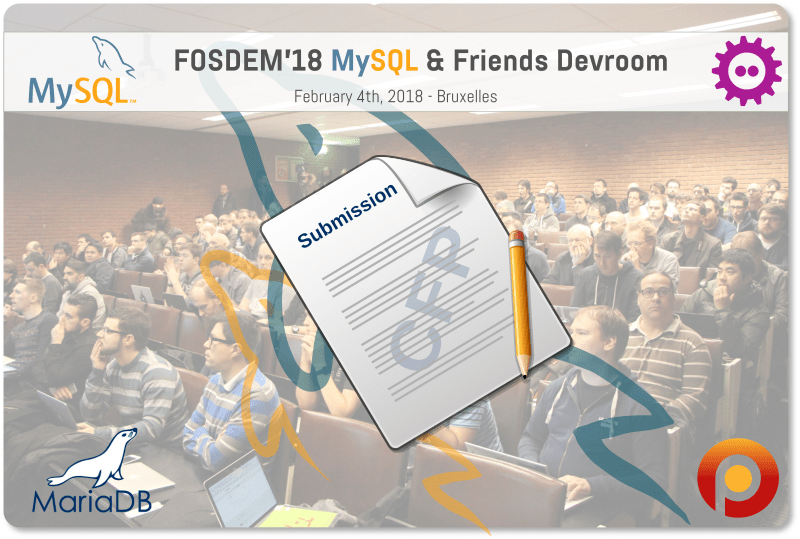 FOSDEM 2018 – MySQL & Friends Devroom: CfP is open ! Good news ! The MySQL & Friends Devroom has been accepted for Fosdem’s 2018 edition ! This event is a real success story for the MySQL ecosystem, the content, the speakers and the attendees are growing every year. 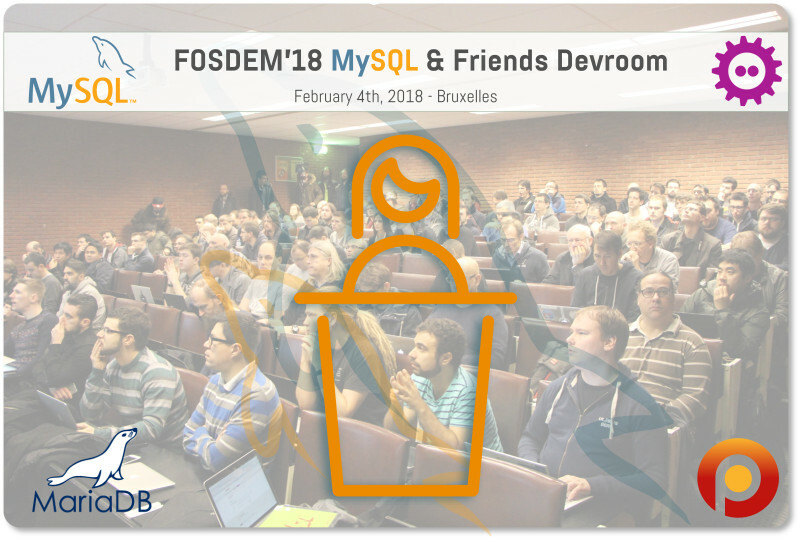 Fosden 2018’s edition will take place 3rd & 4th February in Brussels and our MySQL & Friends devroom will run on Sunday 4th. FOSDEM & MySQL is a love story started 18 years ago ! The committee selecting the content for our devroom is not yet created and if you want to be part of this experience, just send me an email (candidate at mysqlandfriends dot eu) before Oct 20th . The Call for Paper is open, you can already submit your proposal using FOSDEM’s submission tool. Marketing and sales talks are not welcome, focus on the engineering, the operations and of course the developers. Don’t forget to specify the track (MySQL and Friends devroom) and set the duration to 20 mins (short but intense ;-) )!